Your financial support makes it possible for us to provide hope and the promise of a beautiful future to precious children around the world. Each meal costs less than a quarter to make and more than 90% of total donations goes directly toward feeding kids. Your gift goes a long way in the fight against world hunger. If you have not received a 2018 tax-statement and would like one mailed to you or if you have any questions, please email us at donorcare@fmsc.org. In your email please provide your name and the address where you would like your statement mailed. FMSC consistently receives the highest awards for accountability and transparency. Your donation truly goes straight to feeding kids—and we wouldn’t want it any other way. With a monthly financial commitment, you can make a huge impact on hunger. Your dependable monthly support provides HOPE through food to kids every day! 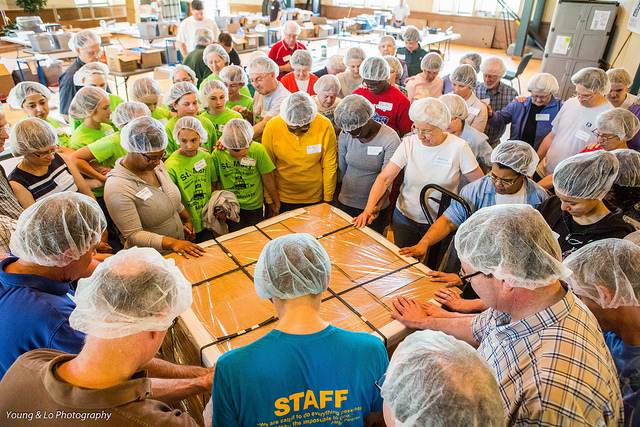 Through FMSC MobilePack events, you can engage in an impactful meal-packing experience just about anywhere in the United States. It’s easy to make a difference in the lives of precious children by fundraising for FMSC!